If you want to grow cannabis for the first time, you’ll need to get familiar with some ground rules. There are many different options for marijuana strains, grow lights, nutrients, and grow spaces. The first step to growing marijuana is choosing the exact purpose you will be growing for. There are different strains of cannabis and before choosing a particular type, you should think about what results you are aiming for: Medical or non-medical use, what kind of smell and appearance, and whether you want your plants to deliver more mental or physical effects. Sativa strains are used for anti-anxiety, ant-depressant, chronic pain, increasing serotonin, and increasing focus and creativity. Indica strains are used for mental and muscle relaxation, decreasing nausea, managing acute pain, increasing appetite, boosting dopamine. The auto-flowering or hybrid strains are a mix of Indica and Sativa strains. They are mostly small and are good for beginners because they have a short cycle of 2 to 3 months. Their psychoactive and physical effects depend on the traits they inherit from their parent strains. Good air circulation is very important for your plants. A strategically placed fan is highly recommended. As you will need to keep your space sanitized to protect against fungus and pests, pick one in which you would have easy access to cleaning. Avoid carpets, drapes or raw wood. Your grow room must be light-sealed so the plants are only exposed to grow lights. Pick a convenient place which is safe and easy to get to, so that you will be able to monitor your cannabis plants every day. Pay attention to the temperature, and if it is too warm, invest in a fan. Cannabis grown outdoors can grow to the size of a tree in less than a year, thanks to the energy they utilize from sunlight. But when you grow marijuana indoors, your lighting is your number one priority. That is why an investment in the best grow light for your needs is a good idea. How to determine which type of light would be the best? Learn more about the advantages of each type, so that you can assess which one will be best for you. They are more expensive than the fluorescent and the HID grow lights but they do have an increased lifespan, their light is healthier for plants since they produce limited harmful wavelengths, they produce a full spectrum of light, and they are 100% recyclable. Compact fluorescent lamps or CFLs are significantly cheaper and easier to use than the other options. They do not generate a great amount of heat and provide enough light to keep your plant in a vegetative state. They are less efficient than the other options but they are a good option for novice indoor growers. HID (high intensity discharge) lights can be either an HPS (high-pressure sodium) or MH (metal halide). The two types differ in terms of the stage that they should be used in. MH bulbs should be used during vegetative growth, while HPS bulbs are a better option for the mature flowering stage. Don’t overwater or overfeed your marijuana plants – they prefer a wet/dry cycle. Burnt leaf tips are the first sign of overfeeding and drooping leaves are a sign of overwatering. Use a 10-5-5 organic fertilizer: 10% nitrogen, 5% phosphorus and 5% potassium. Nitrogen fosters growth, phosphorus is for the development of roots and flowers, and potassium supports root growth and photosynthesis. During the flowering stage, use a fertilizer with a lower nitrogen count. Timely harvesting and proper drying are as important as the growing. 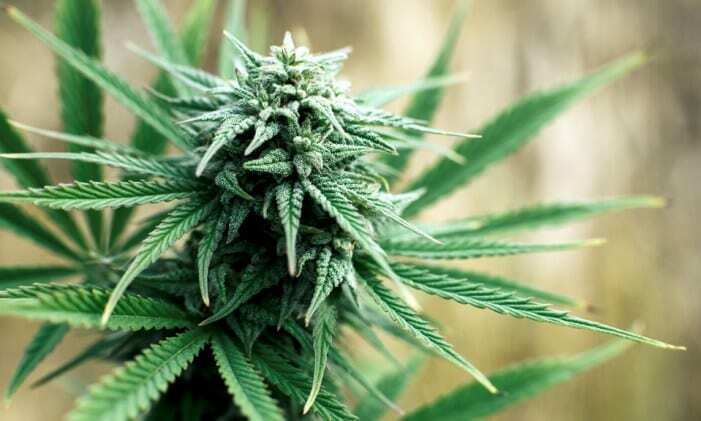 Cannabis plants are ready to harvest when tiny crystals appear around the flowers, the plants have an intense smell, the flowers are sticky, the pistils change their color (from white to red/brown) 60-70% of the white hairs curl in, and a few larger leaves turn yellow. To harvest your plants, use a sturdy pair of scissors and cut the plant down from the root ball. Then trim away the extra leaves and hang up your buds to dry. Drying should take a week or two depending on the humidity and heat. For your buds to dry slowly, humidity of 50% and temperature around 70 degrees achieve the best results. Once the small branches snap and the outside of the flowers feel dry, the buds are ready for curing in jars. Use opaque jars and choose the same temperature for the curing phase, but with humidity of 60%. Make sure you open the jars daily for a period of 1 to 3 weeks. It can take up to 8 weeks for your marijuana to cure. Luis Rivera is the president of Advanced LED Lights, a leading LED grow lights manufacturer based in Hiwasse, Arkansas. When not at work, Luis enjoys swimming, yoga, as well as growing grapes and flowers in Sonoma, California.